This time last year, I was limping due to a combination of plantar fasciitis and muscle soreness, both brought on by running. 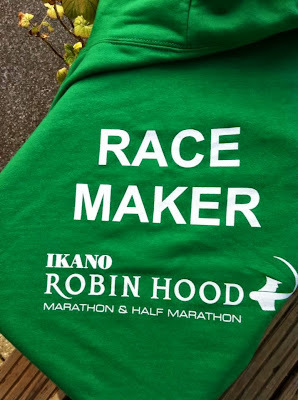 The PF had been bothering me since the summer, but the muscle soreness could firmly be laid at the feet of the Robin Hood Half marathon. I took something like 5 minutes off my personal best for the distance - to 1 hour 51 minutes and 59 seconds - but inevitably had to pay the price over the course of the next four days. Over the course of the following twelve months, my body has given me enough messages that even someone as stubborn as me has been forced to pay attention and to cut back my miles. At one point, I was reduced to a single, pathetically short and painful run of about three miles each week. Since then, I have slowly been able to build myself back up to three runs a week and a max distance -- so far -- of about five and a half miles. The thirteen point one miles required to complete a half marathon are sadly out of the question for me at the moment as my body simply cannot stand the workload any more. * tell that to the team who challenged the result, refusing to believe the evidence of the finishing chips that told them that another team had crossed the line well in front of them... they were a team of fun runners too. C. volunteered too, and our job was to turn up at 0630, help set things up in the tent and to get people signed in, and then to take the runners doing the second leg on the bus to the change-over point, supervise the change and then walk the first leg runners back to the rendezvous point. It was a bit chaotic from the moment when our bus driver clearly had no idea at all how to get to the change-over point through all the various roadworks and traffic restrictions, and we had to keep hopping out and moving bollards to get him the wrong way through a one way system. The change-over point itself also had absolutely no markings, so it was something of a job to pick out the relay runners from a crowd of 10,000 other runners and make the handovers. The best part for me was watching the whole field go through... twice... once at the three mile marker as we marshalled the first relay change-over, and then at the final rendezvous point a little after the twelfth mile. It was a real privilege, actually. It was a beautiful day, but I got to see the first runners coming through the three mile marker in a time of a little over 12 minutes (12 minutes!) and also to watch some of the incredible wheelchair racers, seeing close-up how rigid their chairs are and how hard they rumble across the asphalt of the road... not to mention how inspiring it is to see guys with no legs competing in a race like this, full stop. Lots of the early runners at the front of the field are very serious and have little time for crowd interaction as they chase their time, but as you go down through the field, you see all sorts of people of all sorts of shapes and sizes and all kinds of motivations... and many of them are really appreciative of a little cheer to spur them on their way. Top tip: always wear a running shirt with your name on because it gives spectators something to shout at you as you go past. I know from my own experience last year that every single time this happens, it gives you a little bit of a lift. 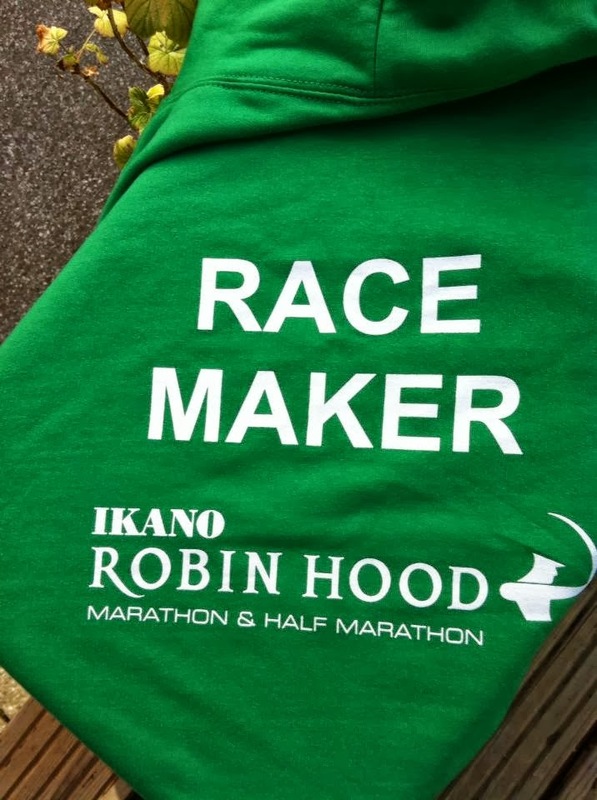 Knowing this, I tried to shout out as many names as I could... even if it was to shout out "GO ON ROBIN" to the many, many people dressed as Robin Hood (they were attempting to set a world record, apparently). I can remember running this a few years ago and being really annoyed by the Macmillan cheerleaders who were all over the course and armed with clappers and lots of enthusiasm. It's not that they made loads of noise, it's that they made a load of noise for their runners and then stopped. 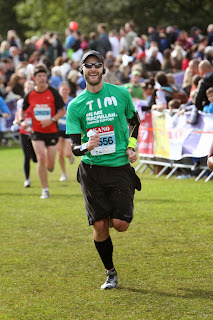 If you're running just behind a Macmillan runner, that's a little depressing. I also remember one of my colleagues saying that he ran the half marathon here once about fifty yards behind a guy with one leg. He said that by the end, he was itching to run up to him and push him over, because over the course of thirteen miles, he'd really learned to hate the way that people would cheer the guy with one leg... and then stop as he ran past. I was therefore determined to clap for anyone and everyone who ran past me. No exceptions. This meant that I did an awful lot of clapping and now have a case of clapping RSI. No matter. It's a small price to pay. Of course, standing about a kilometer from the finish, you get to see people right on the edge of their endurance as they push on towards the end.... some people are too lost in their own private world of pain to respond or to even notice that you are encouraging them, but lots of other people give you a friendly smile and push on. You see the best of people here too, whether it's the two guys practically carrying somebody that neither of them know, just so he can make it to the finishing line, or the guys finishing strongly who use what breath they have to exhort the people that they're passing to keep going. I must have clapped and shouted encouragement at people for about five or six hours, and I loved more or less every moment of it. I think some people liked it too. Perhaps not the guy at mile three who was struggling with the pouch of water he'd just picked up at the drinks station. They're a bit fiddly, but he just couldn't open it. He shot me a filthy look when I cheerfully told him as he passed that it was an intelligence test... and he was failing. I really enjoyed the day. Lots of my friends and colleagues set personal bests, and one fellow member of our running club completed her first ever full marathon to raise funds for the local autism charity that has helped her son. Her time of 5 hours and ten minutes hardly matters, but she did brilliantly. We handed out free corporate relay pasta to finishers of the full marathon simply because it was otherwise just going to be thrown away and we stacked chairs and tables and generally tried to make ourselves useful. It was exhausting. By the time we got home at about three pm, I was only fit for a quick bacon sandwich and then a couple of hours napping with the cat on the sofa. By 2130, I was fast asleep in bed. Volunteering, I think, might just about be more tiring than actually running the damn thing. I've not entirely given up on the idea of running more of these. Time will tell if my poor, feeble body is still up to the task. You know what, though? Even if I can't, I reckon I'll do more volunteering. Especially if they're going to give me a really plush hoodie every time... albeit in a lurid lincoln green kind of a colour.